Born both from a history of random streams within our Skype group and from a desire to form some kind of actual group that plays and comments on ZC (and non-ZC) games to discover flaws in or goof off with. Or maybe even enjoy them. Part of this is a way to dig up common quest flaws,bring them to light, and discuss them live. Most of it is to just generally mess around and be our usual goofy selves while playing games we may or may not even enjoy. 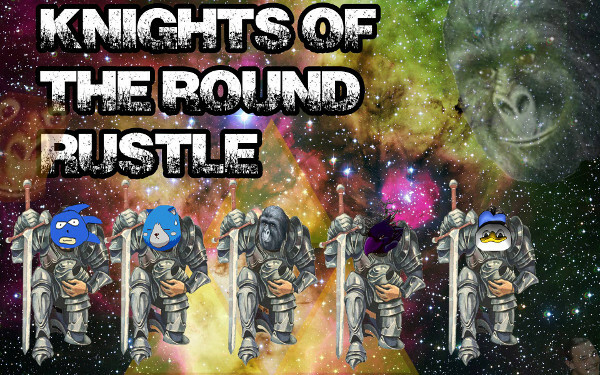 We are the Knights of the Round Rustle. Eventually this post is gonna get prettied up a little and rewritten, but I just basically wanted to use it as an announcement for this idea and our first stream tomorrow in the afternoon/evening/whenever, more info to come, but our first game is going to be Link To Tortuga by Freedom. Come join us at our new Twitch channel! YouTube channel to come I'm sure probably. I'm seriously looking looking forward to this. There are clearly a lot of misconceptions out there on how game content should be viewed. While it can't be an entirely objective process, I at least look forward to discussing things we can maybe agree (or even disagree) on while maintaining some actual semblance of meaningful feedback. As for streams, if they start late at night, boy I wish I'm living in the US, because I won't be able to attend any of them lol. This will probably happen sometime this evening, as I have unexpected company coming over tonight, but this should still be on and we hope to see you tonight! Well some unforeseen circumstances occurred today but we'll be ready to start in about ten or fifteen minutes or so for the inaugural session of Knights of the Round Rustle. We probably won't have the full group tonight but we'll make do with what we have and see where this takes us. Hope to see you guys there! Well that was fun, but the fun's not over, Moosh has taken over with A Second Mario Bros. X Thing, aka A2XT, so don't leave just yet, or if you missed Tortuga, there's more to be seen! We're going to be continuing Link To Tortuga tonight at 8PM EST, and see how much more of it I can take. After that we may or may not have additional content like last time, but regardless hope to see you guys around again tonight for more fun! Sorry for the long absence, things have been up and down the last couple of weeks, but tonight Moosh is taking us on another adventure through A Second Mario Bros. X Thing, starting soon! RIP. Missed this during it's prime.